Africa Wanders From Mandela's Path To Democracy : Parallels Mandela showed the way as African states began to democratize in the 1990s. Today, African countries are holding elections with greater regularity than ever before, but it's still relatively rare for power to change hands at the ballot box. 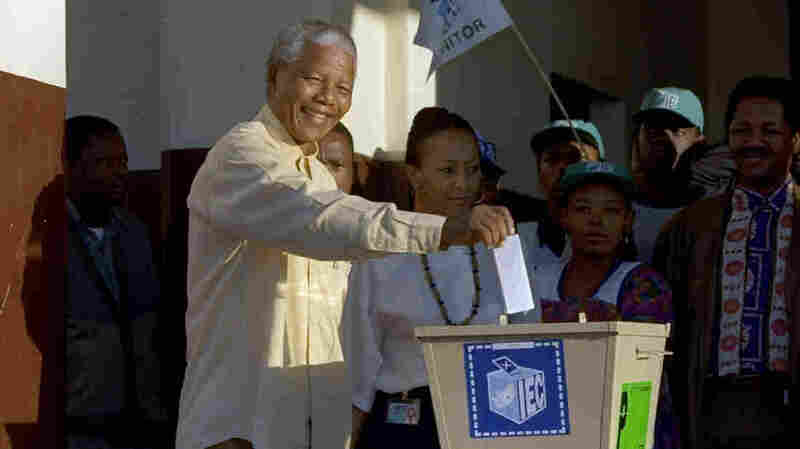 Nelson Mandela casts his vote during South Africa's first all-race elections in 1994. Mandela's example led to more democracy across Africa, although overall political freedom has declined on the continent in the last five years. When Nelson Mandela was released from prison in 1990, Africa's record on democracy was abysmal. One stark fact summed it up: Not a single African leader had ever lost his job at the ballot box in the three decades since African countries began receiving independence around 1960. But with Mandela leading the way, South Africa became the most prominent example of the emerging democracies and open elections that spread across the continent in the 1990s. The end of the Cold War also meant that the U.S. and the Soviet Union withdrew support for many African dictators. In some African states, this created the space for competitive politics. It other places, the dictators fell and the nations collapsed into chaos. Think Somalia. So which way are the trend lines pointing today? African nations are holding elections with greater regularity than ever before. However, a change of power through elections is still relatively rare and many authoritarian leaders have learned how to hold elections for show while making sure the preferred outcome is never in doubt. In a eulogy for Mandela on Tuesday in South Africa, President Obama described him as the "last great liberator of the 20th century." Then, in a message directed at leaders across the continent, the U.S. president said it was not sufficient to simply praise Mandela. "There are too many of us who happily embrace Madiba's legacy of racial reconciliation, but passionately resist even modest reforms that would challenge chronic poverty and growing inequality," Obama said, referring to Mandela by his clan name. The past couple of years reflected the mixed picture and contradictory trends when it comes to democracy in Africa. In Senegal, the African country that's perhaps been the most stable over the past half-century, challenger Macky Sall easily won the presidential runoff election in March 2012 over Abdoulaye Wade, a two-term incumbent whose third term was opposed by many voters. Both rounds of presidential voting were carried out smoothly. Meanwhile, in Zimbabwe's election in July, President Robert Mugabe, who is 89 and has ruled for 33 years since independence, won another term. International observers described the election as flawed due to ballot box irregularities and intimidation by Mugabe's party. "Africa is getting to the point where elections are becoming the norm in most countries," said Brooks Spector, a former U.S. diplomat who now lives in South Africa and writes about African politics for the website The Daily Maverick. "However, the record of governance in many countries is still very spotty." Coups are less common than they used to be, but African leaders are still more likely to be tossed out at the point of a gun than in a multiparty election. In the Central African Republic in March, Muslim militias ousted President Francois Bozize, who is Christian. This marked the first time Muslims have come to power in a predominantly Christian nation. The ongoing fighting has displaced hundreds of thousands. French troops are now trying to restore order and the U.N. has voted to send in a peacekeeping force. The Economist magazine last year judged there to be only one full African democracy — the Indian Ocean island nation of Mauritius — and 11 "flawed democracies" out of the more than 50 African nations. The U.S. group Freedom House, which ranks the relative freedom of countries worldwide, said in its 2013 report that overall, conditions in Africa have declined for the past five years. "While the region saw several significant gains, especially in West Africa, civil conflicts and the emergence in some countries of violent Islamist groups prevented an overall upgrade for political freedom," the report said. Next year, South Africa will hold its fifth election since the end of apartheid two decades ago. Vigorous debate in parliament is the norm, the media is aggressive and lively and ordinary citizens remain extremely proud of the country's democracy. However, there's growing cynicism over corruption and the sense that the African National Congress, Mandela's party, has become complacent after so many years in full control of the government. The ANC remains the overwhelming electoral favorite, even though President Jacob Zuma is so unpopular in some circles that he was repeatedly jeered and booed when he appeared at Mandela's memorial service. Zuma has been involved in a series of controversies, alienating many South Africans. A government watchdog group is currently investigating $20 million in state spending to upgrade Zuma's private home. Zuma's office says it was for improved security, but reports say it also included a swimming pool and other luxuries. The criticism directed at Zuma is seen as part of a larger frustration with many apartheid-era problems that remain unresolved: a lack of decent housing, high unemployment and a shortage of good schools. The government has been unable to get a handle on crime and corruption is seen as becoming more widespread and entrenched. "You can't eat democracy," is a catchphrase for South Africans who support the country's electoral politics, but believe the government hasn't been able to deliver for millions of its impoverished citizens.